This review will take an in-depth look at the Trampoline Pro Jump Slammer trampoline basketball hoop and rate the product based on its specifications, pros, cons, and much more. It’ll also include a fun video showcasing the different ways this versatile trampoline basketball hoop can be used. By the time you are done reading this article, you’ll know if the Trampoline Pro Jump Slammer is right for you. If you are interested in finding an engaging way to practice basketball or to give your child something fun to do, the Jump Slammer might be a good choice. This fun trampoline basketball goal is designed to create a safe and fun environment for you and your children. 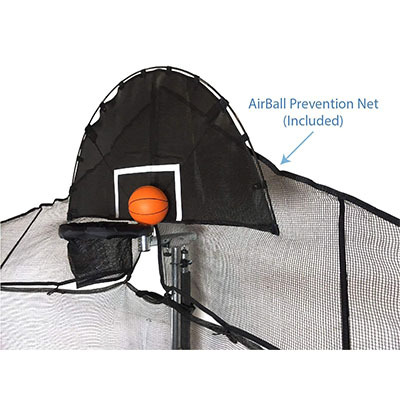 The Trampoline Pro Jump Slammer places a small net around a trampoline and pairs it with a basketball hoop. This design makes it easier for you or your children to have fun jumping, slam dunking, and practicing your shots. Keep in mind that the product doesn’t come with an included trampoline, but is compatible with most trampoline brands that have enclosure poles to attach the net, like Skywalker and Zupapa. These specifications are pretty similar to other types of trampoline basketball hoops on the market. The only few things that might vary are the capacity of the rubber, the size of the net, and the height of the hoop. Most of the time, the height can be easily adjusted to ensure you can get the most out of it. The Trampoline Pro Jump Slammer trampoline basketball hoop is typically designed for younger children. On the other hand, teenagers and even adults may use it as well. As for durability, this product is designed to offer a stable and safe environment where you can play and slam dunk the foam basketball. The design of this play area is set up for a summer play experience. While you can use it in spring and fall as well, it may be a little too cold for some children to tolerate. Winter play is not advised as the excess moisture in the air combined with low temperatures could make it very uncomfortable. Safety Flex Rim – Jumping on a trampoline can be a risky activity. However, you’ll get a safety rim that will keep you or your children from getting injured in the heat of the moment. Adjustable Design – Change the height of your basketball hoop to create a more fun and engaging play environment. Any extra height will require more vigorous jumps. Rubber May Be Slippery – When it rains or gets damp on the trampoline, you might slip and fall and hurt yourself. Tighten the included screws to hold it tight. While this is not an official video for the Trampoline Pro Jump Slammer, it does give you an idea of how it should be used. The following material also showcases a few ways to stay safe while enjoying it, as well as a few fun tricks you can pull off while jumping. What Are User Reviews Saying? A few injuries occurred when being used. That being said, many positive reviewers either dismissed these drawbacks or came up with positive aspects that outweighed them. For example, many praised the ease of construction and were happy with the product’s overall durability. Others praised the lifetime warranty that came with the product and that they were still enjoying it years after the initial purchase. If the Trampoline Pro Jump Slammer sounds like the kind of play area that your children would love, don’t hesitate to try one out. We think that it is more than worth the price and a great addition to anyone’s yard. And if you have any experience with this product and want to share it, please don’t hesitate to drop a line and let us know. If you have little active boys, then you will want to get the Trampoline Pro Jump Slammer trampoline basketball hoop. My sons absolutely love it and it keeps them busy, as well as out of trouble for quite a while. Hello, Jonathan! I hope this little item will be the starting point of a lot of fun family memories. Always glad to hear our Top Trampoline Tested recommendations are making users happy. The Trampoline Pro Jump Slammer trampoline basketball hoop is a great thing to have but the issue is that you have to put it together yourself unless you spend the money to hire someone to do it. If it came assembled, then I would like it more. Hey, Carlo! Thank you for writing about your experience with the Trampoline Pro. Unfortunately, there’s no technology yet to deliver such large products right to clients’ doors or make the assembly an easier job. Nonetheless, there’s still time and who knows? the ideal solution might be just around the corner! Until then, we have to put up with hours of hard work just to get to the fun part of a trampoline. Or hire a specialist to do that for us without leaving room for any mistakes. I would never tell anyone that the Trampoline Pro Jump Slammer trampoline basketball hoop is a good make. My son is under 10, and last summer he was playing on it since a neighbor of ours has this. He fell and injured himself, and I am glad he did not break anything. That was terrible. So sorry to hear that Sharon! Maybe your neighbor didn’t put it together right? The Trampoline Pro Jump Slammer trampoline basketball hoop looked like it would have been a cool addition for our home. However, I had to take it back because there were no clear instructions on how to put it together as it was very ambiguous and confusing. So sorry Brent! We’ve got a guide on that and also the people at Amazon are generally very helpful in these situations. I have not heard much about this trampoline but I have to say it looks quite impressive. I have 2 boys and they would absolutely love this. They are both under 6 so this would most definitely keep them busy. Hey, Chuck! Yes, you’re right about the trampoline basketball hoop keeping your kids busy. It was especially designed to bring back the fun to a trampoline once the excitement of jumping is gone and keep kids occupied for hours on end. Also, it has a very sturdy built and it has taken a beating from kids much older than your two sons. It is indeed an impressive and durable product (which is quite rare these days). Just let us know how it went. I foster 2 autistic preteen boys and they are not very big. I was thinking about getting the Trampoline Pro Jump Slammer trampoline basketball hoop because I strongly feel this could be beneficial for their growth and development, and eye-hand coordination. What do you think? Hey, Lena! Sure, that’s such a great idea. All kids will love it as it gives something else to do on a trampoline than just jump. The Jump Slammer is also a great way to improve children’s motor skills while keeping them safe. Go at it. You won’t be disappointed!